Ganesh Anandan is a percussionist, composer, improviser and instrument builder. He studied the South Indian Carnatic music, namely the flute, for seven years with G. Venugopal and the Mrdangam, a percussion instrument, for seven years with K. K. Parthasarthy in Bangalore city, India. In 1977, he moved to Canada and studied western percussion notation and piano. He was part of the Université de Montréal Gamelan orchestra for a year, which highly influenced him. He was awarded several grants from The Canada Council for the Arts and Le Conseil des Arts et des Lettres du Quebec for artistic projects and higher studies in India at the renowned Karnataka College of Percussion under T. N. Shashikumar with whom he studied Tavil and Kanjira. In 1992, Ganesh transposed the Carnatic drumming vocabulary and techniques to other types of hand percussion instruments such as frame drums, cajon and others. He published an educational book and DVD called "Solkattu", concerning these transpositions. In 1994, he built a series of melodic instruments based on the Indian 22 Shruti System (22 interval octave) including the Marimba, Metallophone, Bamboophone, Tubeophone and others. He also wrote music for them. In 2002, he built the electric six- and 12-string Shruti Stick, a cross between a Zither and a Prepared guitar. Ganesh was commissioned to write a piece called Autorickshaw Ride (11min.) for Ensemble Modern (Frankfurt). He toured with them in 2004, 2006, 2008 (see the recording section of his website for more information). He was also commissioned by Canadian Heritage to write a piece and present it at their annual conference for the Arts and Culture in Ottawa in 2003. He has scored several documentary films. Ganesh has worked with a variety of Canadian and international artists including: Ensemble Modern (Germany), Hans Reichel (Germany), Franz Hautzinger (Austria), Conny Bauer (Germany), Espace Shruti (Interdisciplinary project with French sculptor Pascal Dufaux and shruti instruments), Omar Sosa Quintet (Cuba/USA), Carlo Rizzo (Italy), Paolo Angeli (Italy), Gavino Murga (Italy), Malcolm Goldstein (US), Glen Velez, (US), Bob Brozman (US), Glen Moore (US), Savina Yannatou (Greece), Ramesh Shotham (India/Germany), Karnataka College of Percussion (India), Debasish Bhatacharya (India), Hideo Arai (dance/Tokyo) and others. 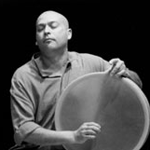 In Canada, he has worked with Ramasutra (Ram Borcar), SoCalled Orchestra (Josh Dolgin), Inuit singer Tanya Taguk, Lui Fung, Doug Cox, Rainer Wiens, Patrick Graham, John Gzowski, Nouveau Theatre Experimental (Daniel Briere and Alexis Martin), La Nef, Robert Lepage, Roger Sinha (dance/choreographer), Hari Krishnan (dance/choreographer), Margie Gillis (dance/choreographer) and others.